Whats the point of Groups can someone explain this to me? Whats the point of these 4 dots and the green and blue color in it? So Group chats like skype introduced which might be very cool but on the same time why would people even need servers if we can bring 100 people in a group? This is making things weird now. The whole concept is kinda unclear for us, the users, without any explanation of the shown features. Discord can easily do such things like Groups/PMs/Servers because they host it all on their side. 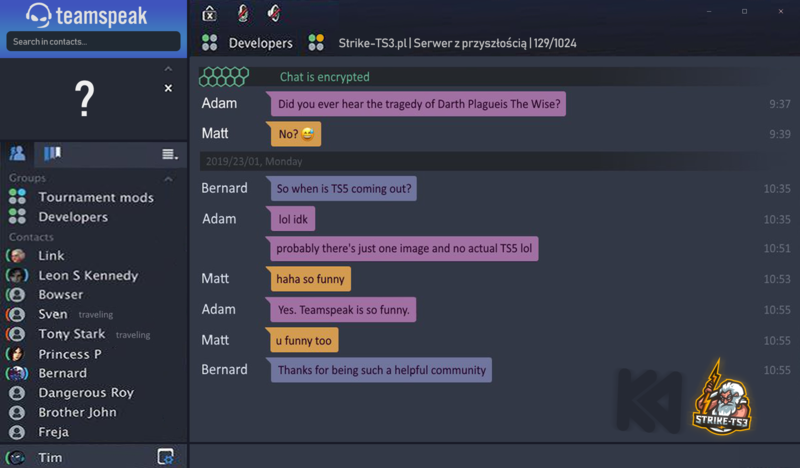 Teamspeak on the other hand will still use the TS3 server software. This would mean all the PM and Group chats will be per client/group per server. Unless they have some other glorious masterplan like doing a global chat server that you can chose to use or whatever. Well, something that would be really nice with TS5 client is if it had a mini 10 slot server embedded (only one channel and no permissions beyond moderation by the host, default group not allow connection, but client auto adds client UIDs to [temp] server member group that can connect ). Looking at the global chat it looks like text only, would be neat if a member of the chat could say lets talk this out, and start a mini server that attempts to use uPNP port config at the router (or configured to a fixed incoming port, if user preconfigured this knowing that uPNP is not enabled for whatever reason [likely security concerns]) and sends the public IP to others in the channel to join the voice chat. When host closes client or ends the session the mini server stops and if uPNP was used it deletes the forwarding record in the network hardware. I say the embedded mini server should be no more than 10 ports and very limited permissions, so that even the no license 32 slot has appeal if they want more people on it. Alternately the person could connect to a dedicated server and share an invite link to a chat group, we could do this manually anyway. Using MM/DD/YYYY (and assuming YYYY to be 2019) then H can not be 1, it can however be 2 or 3. Teamspeak won't use such an antiquitated date order.